After some weeks thinking about that battle I decided to give it a go. Please use this link for more Details of the battle, map and OOB. I changed the Scenario a bit before the battle. 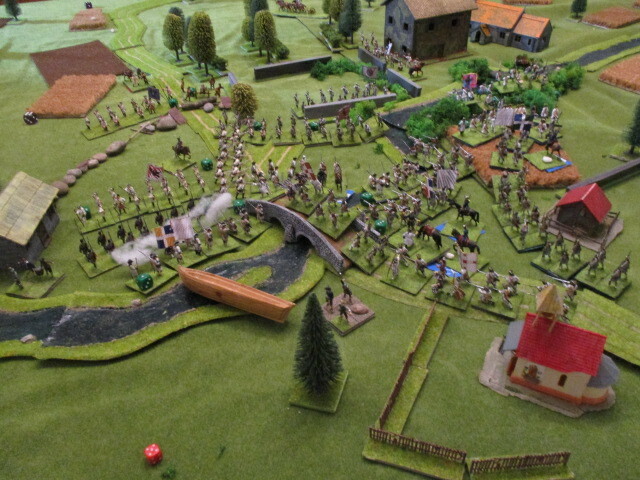 Now the French Player can choose which of his 3 Brigades off table arrives in which turn. 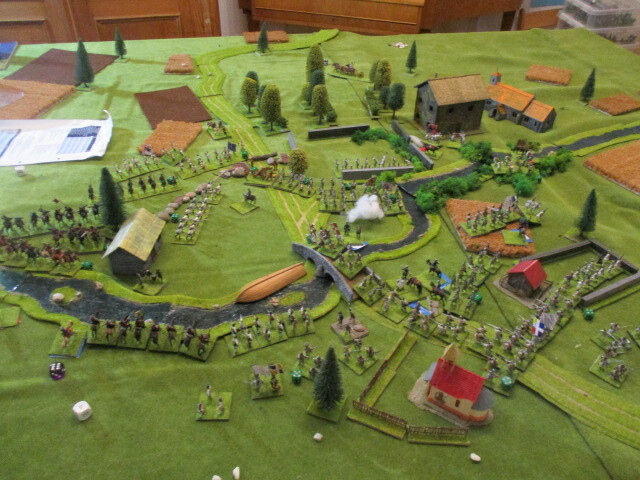 As in all WPS-battles of our 2018/19 campaign, I had the Austrians and my wife the French. I wanted to follow some steps of Württemberg's style of leadership. Therefore I decided to attack with full speed. Ligneville had the problem to march trough the streets of Colorno although his small units could march in line. At the same moment halve of Walseggs batallions had to advance through the parc of the Palazzo Ducale and could do so only on the narrow avenues. 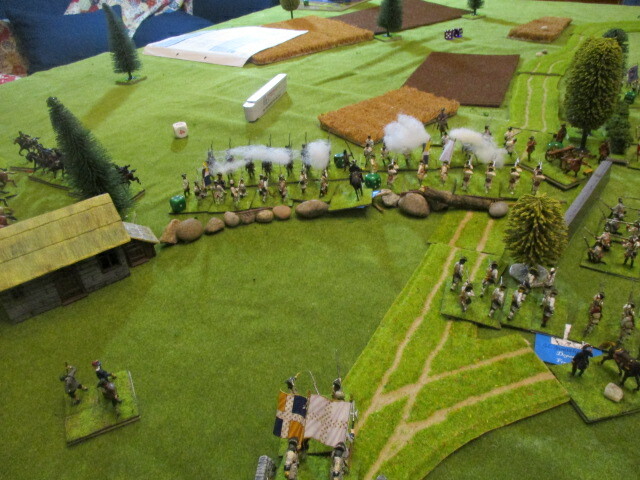 Contades' defenders just had to fire on them and Walsegg's first assault was repulsed by Contades' large batallion. At the same time Walsegg ordered some of his grenadiers to advance on the road from Parma. Naturally I never believed that it would be possible to break through the French position. Walsegg pulled back his grenadiers in front of the baricades and hoped to advance again when new bn.s were arrived. Meanwhile Maillebois could send some of his grenadiers to reinforce his batallion. Nevertheless Ligneville continued to advance through the streets of Colorno. Unfortunately he could only use one bn. 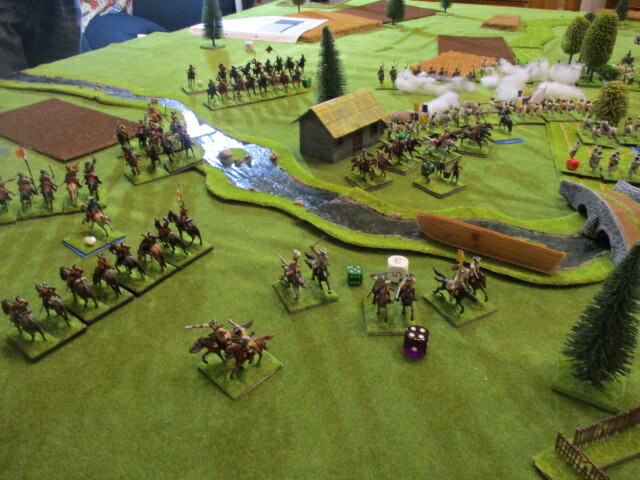 after the other and the first attack with his grenadiers was crushed. He himself was killed in the hail of bullets. 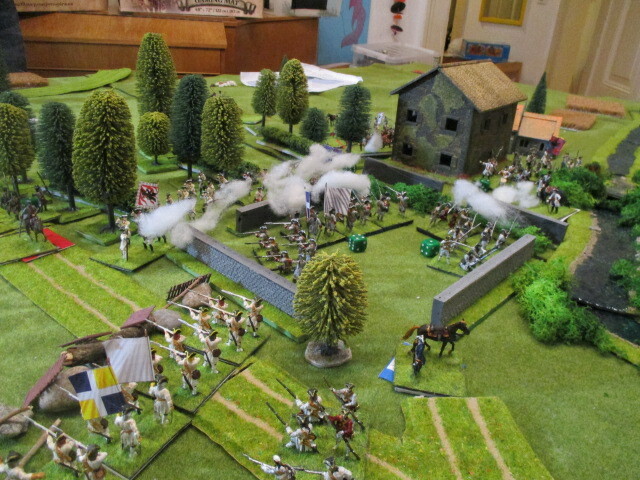 Some of his grenadiers climbed the walls of the Palazzo but killed their by the determined defenders. His Aide de camp (dith.) wanted to continue the fighting with a duel of musketry but was killed too by a French bullet. 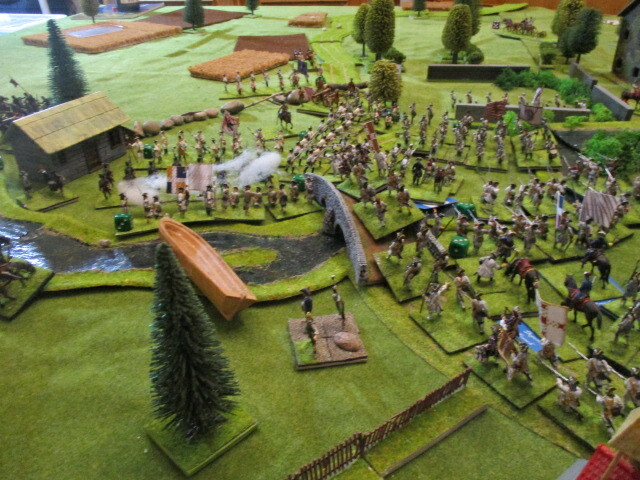 A unknown lieutenant was left to pull back the remnants of Ligneville's Brigade. 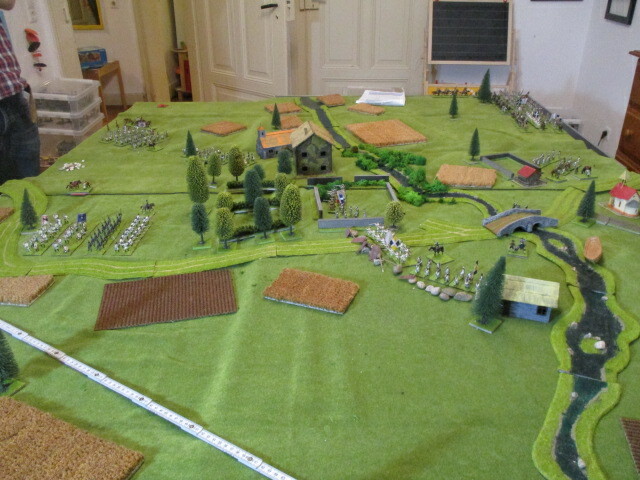 Philibert and Czungenberger could advance but had to be cautious to be not hit by the French infantry volleys. Maillebois - much to my surprise - decided to first call his cavalry on the battlefield although he realized that the cavalry could not fight in the streets of Colorno. Finally he send his horse in columns around the town of Colorno. Finally my infantry supported by Livingstein's artillery which nearly came too late, fired canister and musketballs into the Palazzo and drived out the defending fusiliers first. Later Walsegg's fusiliers stormed the walls and fought bravely supported by some of de Vins men. De Vins became the commander of Ligneville's brigade. 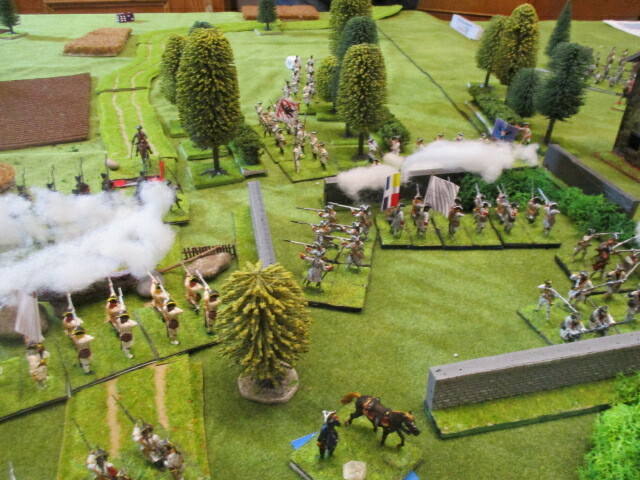 Guerchois' grenadiers retreated and run in the arms of the rallying comrades. Maillebois' large number of infantry had many problems to arrive at the battlefield because too many retreating troops blocked their way. 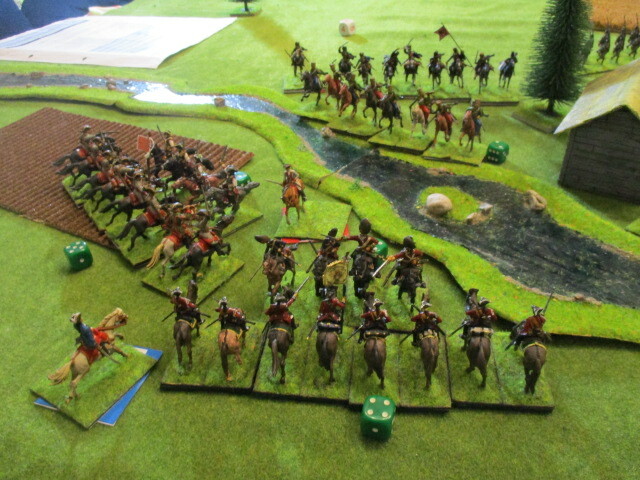 At the same time Philibert noticed his chance and attacked some French cavalry which was still in columns. The result was the same like at Parma. 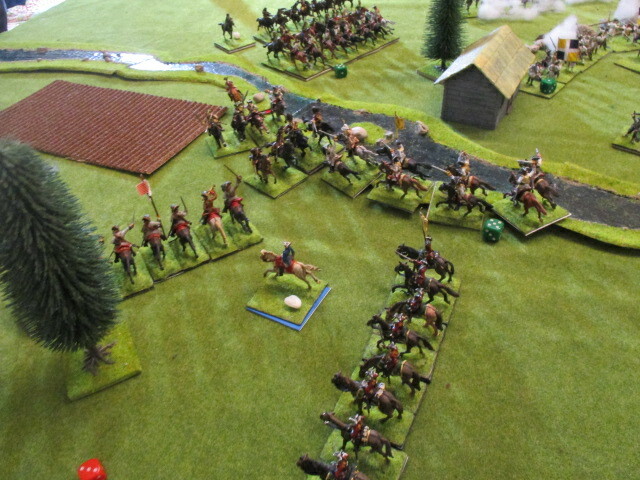 The French cavalry was repulsed or destroyed loosing 3 of 4 regiments in a short time. Only one of Czungenberger's units had to retreat. 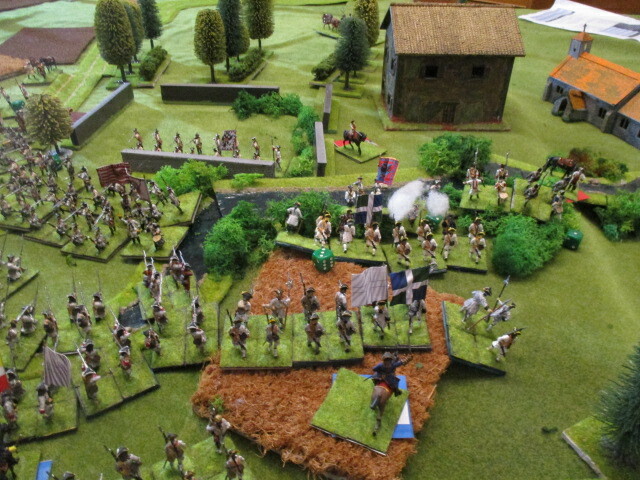 But later he refused to move twice and that saved the French army from a flank attack at their columns of infantry. The French defenders of the barricades became mad and attacked Walsegg's grenadiers to be defeated soon. Maillebois noticed that their was no space for all of his 6 new bn.s and ordered his right wing infantry to cross the Torrente Parma near the Duomo di Colorno. But de Vins, who had send one of his units to reinforce the garrison of the Palazzo Ducale, prefered to cross the river by himself. Naturally that was a bold move, but it was not fruitless. At the last moment (turn 8) I decided that there was no other chance than an all out assault. 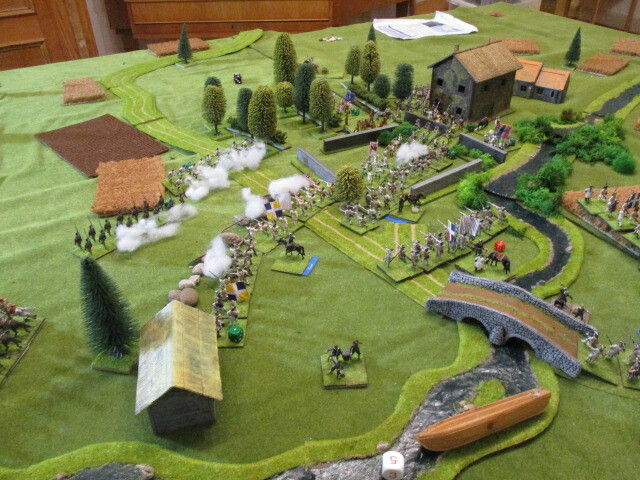 Both of Walsegg's grenadierunits charged and could defeat their opponents. That means that there were no French on my side of the river. It was some satisfaction for the French, that they could destroy one of de Vins batallions charging them. 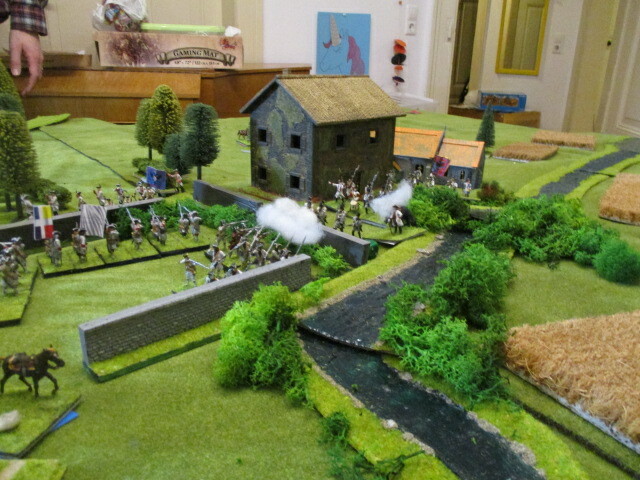 But these troops had done their Job perfectly blockading a whole fresh unit of 3 French batallions. 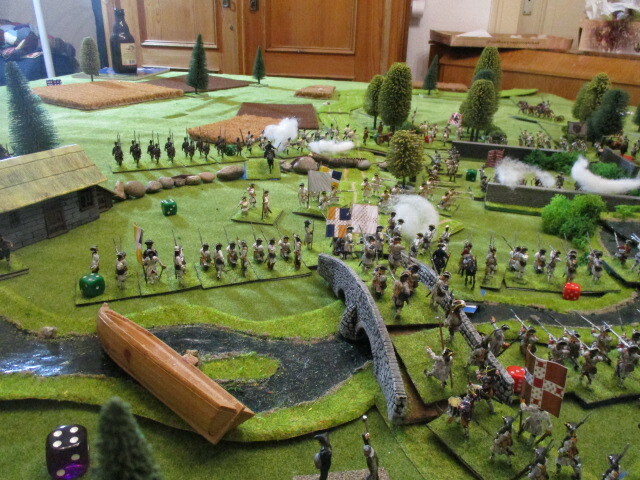 The final situation of the battle. That was a hard fought battle. Even if the French losses were large, I had a lot of luck since I managed to move finally Livingstein's guns. I rolled often 4s and 5s during melees. To storm the Palazzo with cold steel was ambitious. To attack the French horse on the off garde was much of a surprise. I will include photos as soon as possible. Perhaps refight someday with the action switched to the other side of the town? I recognized, that the bridge is on the wrong side, when I checked the contemporary print. Great looking game. I'll have top give this one a try when I get enough units together. I'll have top give this one a try when I get enough units together. It would be great to read your experience than.